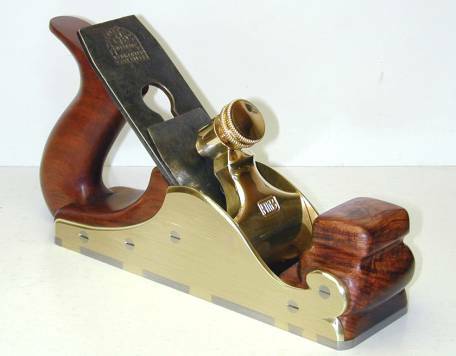 I've collected hand planes and information about them with enthusiasm for a few years now…first it was Patented American planes, Stanley special purpose planes and Bedrocks. 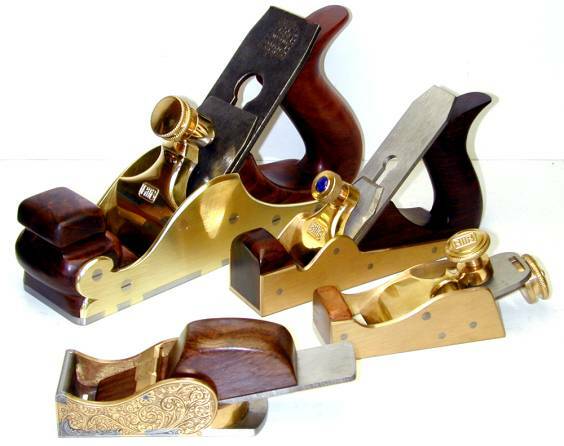 Then I discovered the joys of collecting and using infill planes from the famous makers like Spiers, Mathieson and Norris. Plenty of different Crafts and Trades will share the skills needed for planemaking. Some original and contemporary makers come to planemaking from an engineering / machinist background and some from woodworking (like Stewart Spiers). To some degree these different disciplines will flavour the look of the planes and also the techniques and tools used. Making Fine Handcrafted Jewellery for 30 years has given me a feel for good balanced design, and a run-up start on some the skills needed for plane making. (I've filed metal almost 6 days a week for 30 years.) 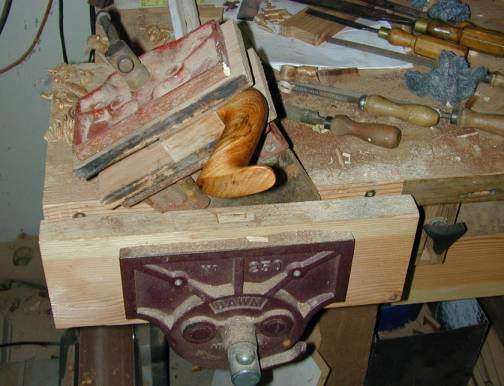 It shouldn't be a surprise that I will use many of the tools from the jewellery bench when making the planes. I like to think my planes will contain some of the history of my professional life as a gold and silversmith, and as keen amateur woodworker, and in the distant past as a student in mechanical engineering. Not always being able to afford to buy named infill planes, I found lots of enjoyment in finding user made infill planes. Studying them carefully and critically, I was always looking for the evidence of problems the makers had encountered, and where they were and weren't successfully solved. 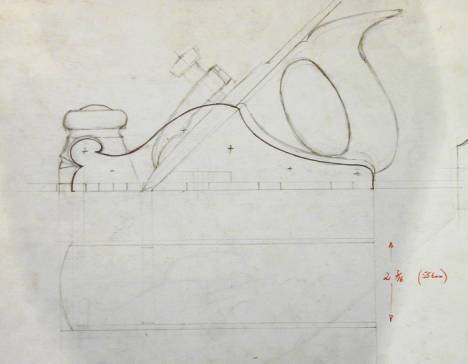 To make a plane that works, following a pattern already drawn, or making a faithful reproduction of a plane is a way to get a relatively quick and reliable result. 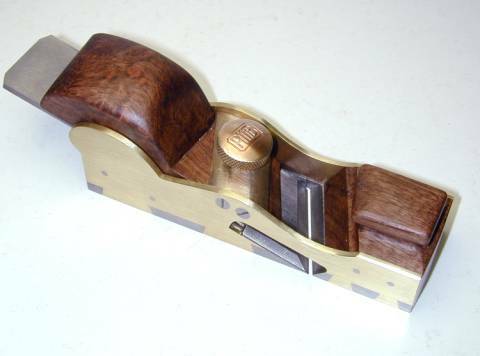 I've used the planes in my collection, and photo's I've collected to ensure the important angles and location of the working parts of the plane are right. I prefer to draw a plan myself, working out the effect on how a plane will work if an angle is changed, or a pivot is moved. On the dovetailed planes, deciding for myself the position, angle and size of the dovetails. Those who have made planes before us must have done this, so their planes are a valuable resource. To know why they are the way they are, then to design a plane around those parameters…its all part of the thrill of making a plane that works well, fits the hands, and looks good. 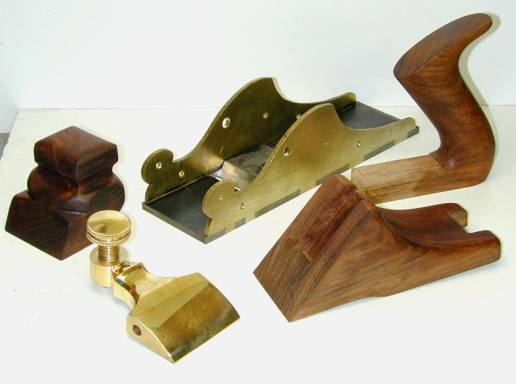 Before I made handplanes I used some cast brass "basket - cases" I'd bought from junk shops and dealers to restore into working planes. This was effectively going back to the bare castings in brass and working forward. I reshape the casting, lead solder a steel base to the sole, re-cut the mouth, and remake the infill and a wedge if it's needed. These restorations gave me a valuable insight into what was involved in making a plane from the ground up. 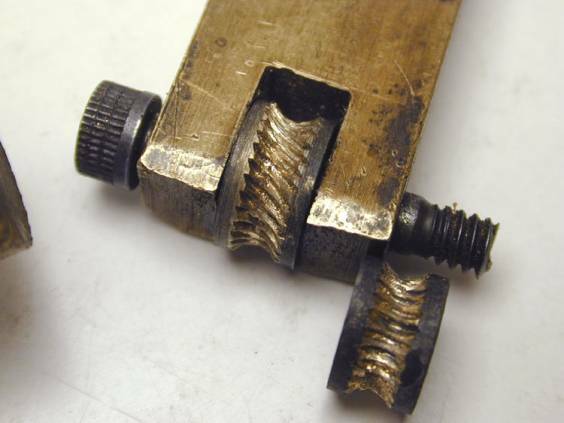 All planes will have critical angles, surfaces, or curves, and to make them I use the same techniques I use for hand making jewellery. Most times I will just lay it out with a scribed line on the inked metal using a rule, square, protractor, bevel gauge and dividers, then go at it with saws, files and a drill. Sometimes I will add decoration for its own sake, trying to get the happy balance of beauty and function that can be VERY elusive…easy to see when it fails, but not so easy to dream up out of thin air. 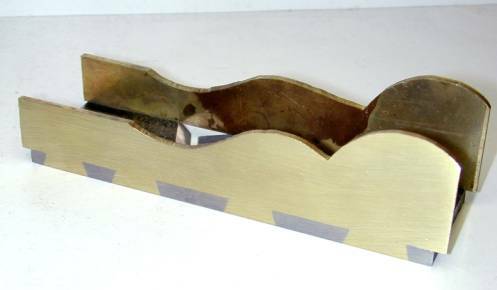 I like brass sided planes so I use 3.0mm (1/8 inch) cartridge brass #260 for the sides, and I cut them out using a jeweller's saw on my jeweller's workbench. This is the side of a smoothing plane…more on that one later. This is where the explanation is more complicated than actually doing it. 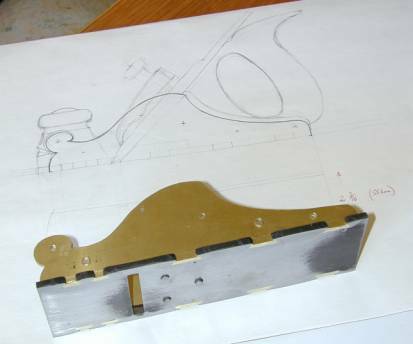 The side plates of the skew mouth chariot plane with the tails formed. I cut down with a hacksaw and then cut along the base line with the jewellers saw, then file to the layout lines. The tails will be about 3 mm proud of the base. The base is mild steel plate, and has the throat cut and the tongue and groove joint made. These I cut with a hacksaw and files. The pins cut in the base and are made to be about 1.5 mm proud of the sides. I cut down with the hacksaw, and then file out the waste between the saw cuts, then file to the layout lines. 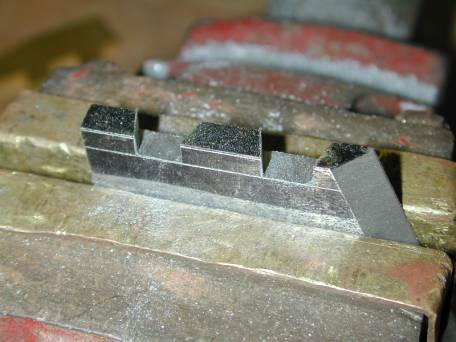 Each one of these takes me about 4 or 5 minutes in the steel, and a bit less in the brass, so on this plane I spent a bit under 2 hours cutting and filing the dovetails. The base is presented up to the sides to check for a good fit, and when I'm happy with that and I have cut the "KEY" into the inside corner of the tails on the base, I squeezed the sides into the assembled base using a large engineer's vice. The key to the locking dovetail, this small relief cut into corner of the pin on the bottom of the base. The brass sides will be peened into this to lock the dovetail and prevent it from coming out. 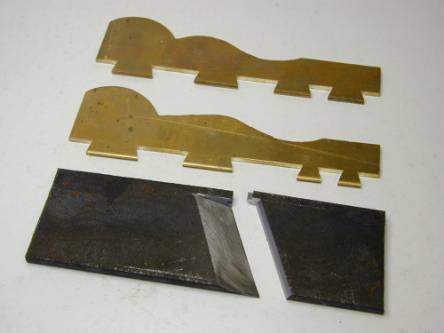 To cut them I used a jeweller's saw, and then dressed them with a fine triangular file that has one face ground smooth. 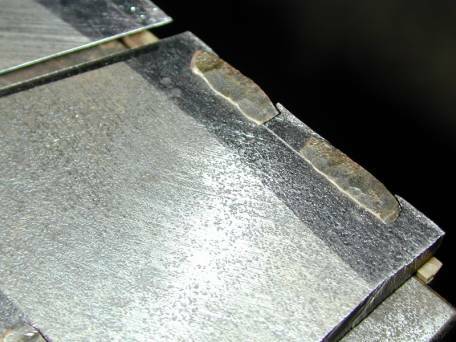 Called a safety edge, it ensures only that surface I want to cut gets filed away. The brass tails were annealed before assembly to make certain they would be soft enough to work properly into the relief cut. Just up to cherry red with the oxy / gas torch then left to cool. I used a cross peen hammer (Warrington) to move the brass initially, then a smallish ball-peen hammer to make certain it went right into the recesses in the base. Working it upside down on a steel block. The sides on the base after a few minutes on the belt linisher. It can be seen the tails will stop the sides from coming up. 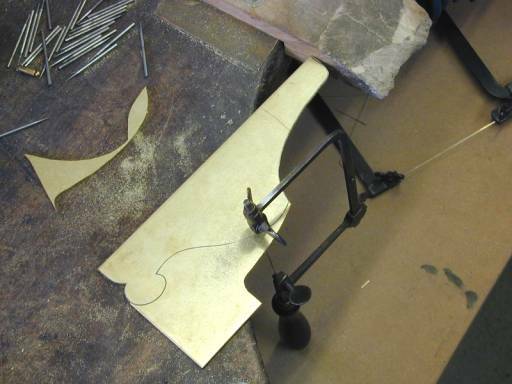 And here where the brass has filled the key, another tail is formed stopping the side from coming of the plane. All locked up with dovetails in two directions. The plane was then ready to drill, saw, and file the side opening. 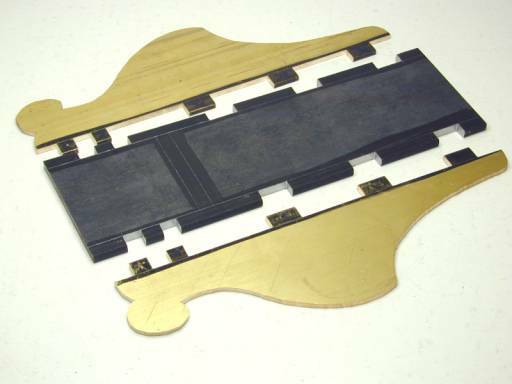 Then the front and rear infills are made using traditional woodworking tools and techniques, followed by the bridge and the wedge and the screw. The blade is made in 01 tool steel, oil quenched from cherry red, and tempered in the oven with the lamb roast. 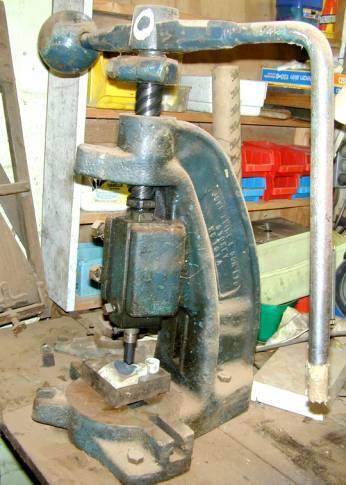 This gives a hardness of about 60 - 62 Rockwell C.
2. Tails on the base and pins on the sides. This is the Spiers configuration, where the sides of the plane are brought down onto the base from above. 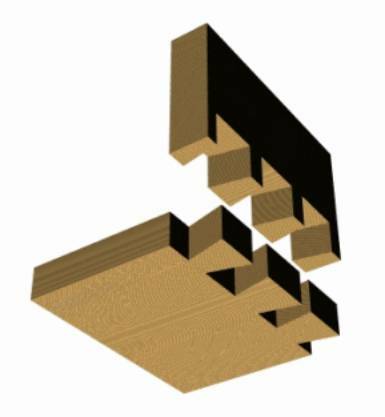 This is the rear left dovetail of the Spiers smoother. I cut the side plate so the piece would drop out the bottom with as little distortion as possible. 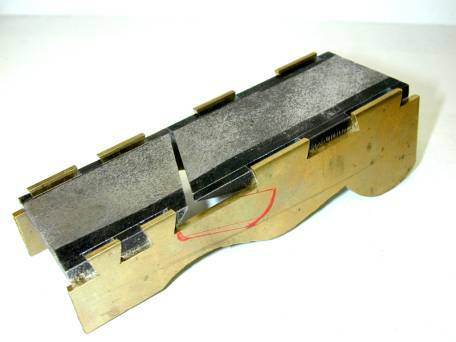 There was a recess filed both in the corners of the tail (on the plane base) at "a", and a recess also filed at "b" in the corners of the pin (on the plane side plate). The base was peened into that recess at "b". And the sides were peened into the base at "a" creating the double dovetail. 3. No tails or pins, just finger joints. 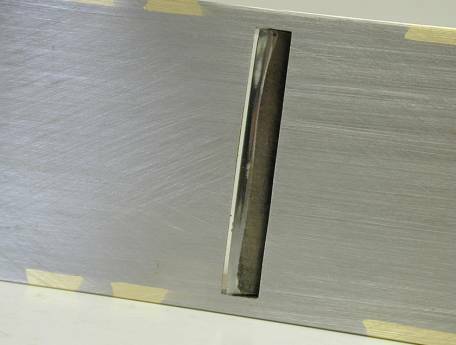 Finger joints cut into both the sides and base - so the metal must be peened into a recess cut in both the base and sides to form the double dovetails. I made the steel fingers on the base longer than the previous plane, 3mm because it is beaten down into the brass recess. Here in a fitted oak block called a "Buck" to hold the sides when peening the fingers into the recesses, locking it all together. A few minutes on the 60-grit belt linisher, and the 3 rivet pins that hold the throat block behind the blade are ready to rivet in place. I cut the lever cap from a solid block of brass using the drill press a hack saw and files, and polished it with emery-sticks and my jewellery polishing mops and buffs. Then I made the knob on my old lathe, and used a hand held tap and die to cut the threads. To do the knurling I made a knurling tool cutter in silver steel, using flex drive and handpiece on my jewellers drill to engrave the pattern into the cutting wheel before I hardened it. My maker's mark, made for me by a punch maker, is stamped into the red-hot lever using a small fly press. The dark patch of oxidation is polished out later. 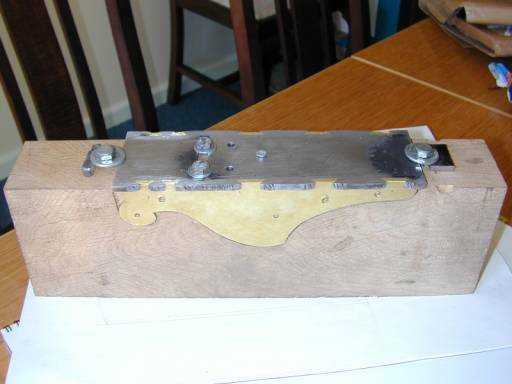 Here are all the parts of the woodwork and the lever ready to assemble. I made the infill in Blackwood using traditional tools - table saw, jigsaw, drill, router, and planes of course…then rasps, sandpaper and steel wool. To make it easier to work on the infill I use a second small vice, screwed to a short board, and held in the bench vice. This holds the work at all kinds of angles, and at a good working height. I filed the sides to the final shape, and filed and polished the graduated chamfer…AND finally finished the wood another coat of Danish Oil. AND where the action is…. Some more planes I've made. This was the first dovetailed plane I made. It was hand engraved by Nick Karagulidis, a jewellery and gun engraver. The wedge is locally grown Walnut. 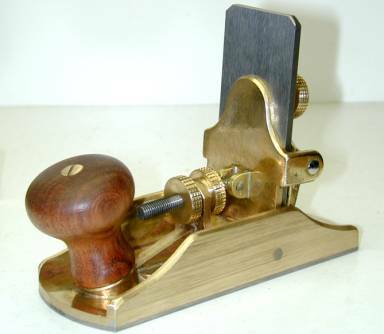 This little scraper plane is based on the Stanley 212, fabricated on a base of brass channel using silver solder, and a steel plate lead soldered to the sole. The knob is Hickory Wattle. 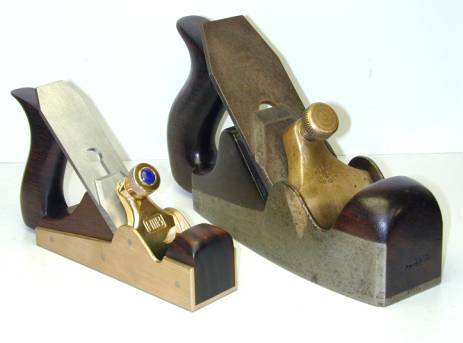 The little #1 size plane next to my Norris smoother is made from a cut-down 1 1/2" square extruded brass tube (found at the scrap metal merchants) It has a steel plate lead soldered to the sole. 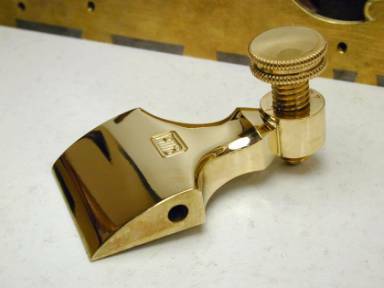 I made the lever cap from brass bar using a hacksaw, drill and files and set a piece of Lapis Lazuli into the top of lever cap screw. 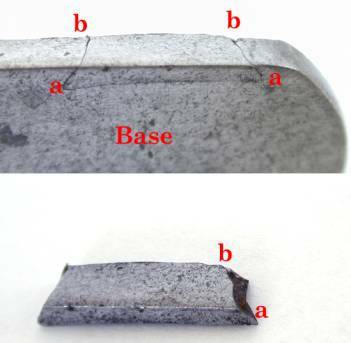 The blade is 1/8 inch thick & 1 1/4 inch wide. The infill is Indian Rosewood. I make these planes for my own entertainment and to use, not for commercial sale. They aren't prototypes for production and although I might count the hours I spend on them, it's not to put a dollar value on them. Because I only use the very limited machines in my workshop, each one I make is an exciting challenge; solving the design and making problems by doing most of the work by hand means I must really extend the skills I have. If you haven't made any before, start small and work up to larger planes as your skills and knowledge develop. 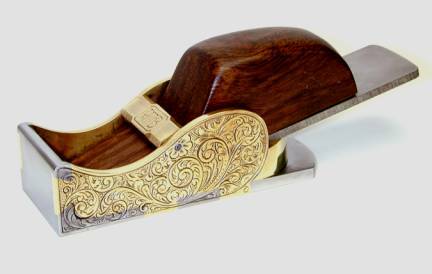 Thanks for your attention, and allowing me to indulge myself by talking about making handplanes. 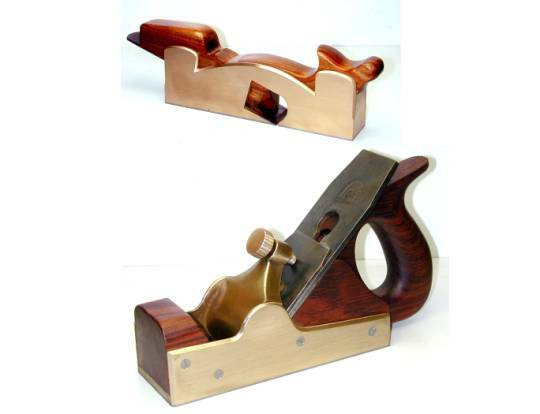 "Making and modifying woodworking tools"
Seen here with a review and more ...by Russ Allen. 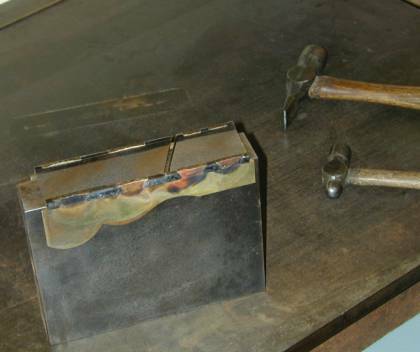 It is very good info for a novice metalworker, but limited detail. However there is plenty of good stuff in it. 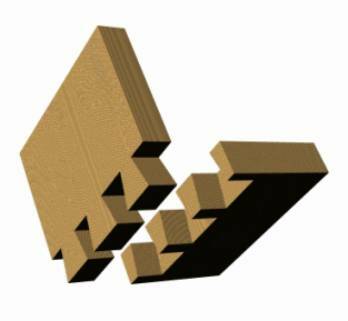 "Making an English-style Dovetailed Infill Smoothing Plane"
No kits for dovetailed planes are available as far as I know. 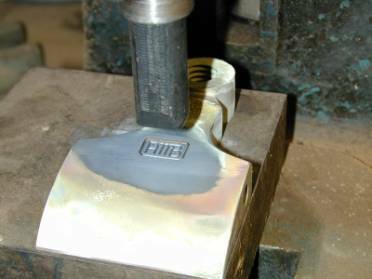 St James Bay Tool Company in Mesa, Arizona, USA has castings for sale. I use mild steel from the metal merchant or the scrap metal yard in Bayswater on Canterbury Road, and brass from George White & Co or from the scrap yard also. 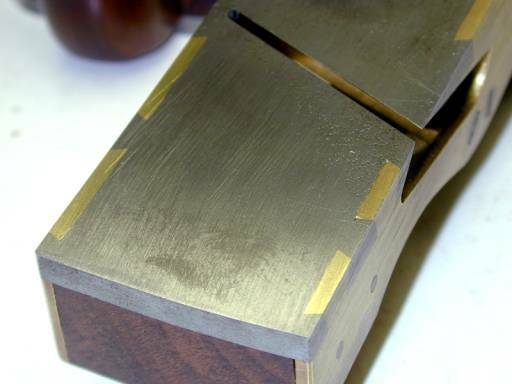 IMPORTANT...if using brass sides, use cartridge brass, #260 (Copper 70%, Zinc 30%). 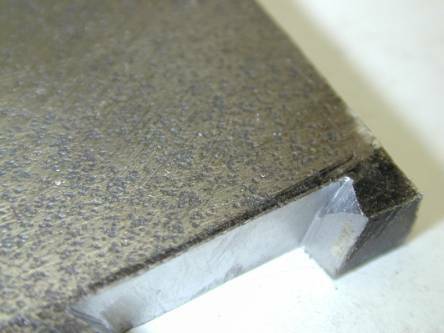 Extruded hard brass #380 (Copper 58.5%, Zinc 38.7%, Lead 2.5%, Aluminium 0.3%) and some others will crack and break before they deform enough to go into the relief cuts. However the hard stuff is good for lever caps and screws, it files, saws, and drills pretty well.